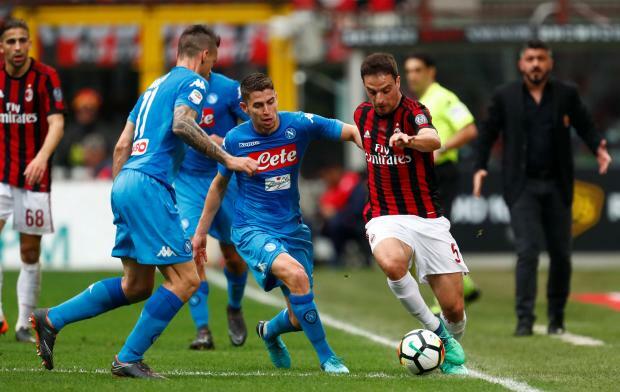 Giacomo Bonaventura (right) moves past Jorginho at the San Siro. AC Milan goalkeeper Gianluigi Donnarumma foiled title challengers Napoli with a stunning stoppage-time save in a 0-0 draw on Sunday and Juventus took full advantage by beating Sampdoria 3-0 to go six points clear at the top of Serie A. Substitute Douglas Costa set up all three goals as Juve put their bitter Champions League exit at the hands of Real Madrid behind them and took a big step towards a seventh successive title. AS Roma, fresh from their remarkable comeback win against Barcelona in the Champions League, hit the woodwork twice in a 0-0 draw with neighbours Lazio, still smarting from their Europa League exit at the hands of Salzburg. Lazio had Stefan Radu sent off in a fiery match which left the two sides level on points in third place. Juve have 84 points with Napoli on 78 followed by Lazio and AS Roma on 61. Inter are just outside the Champions League places with 60. Donnarumma, who became Milan's first-choice goalkeeper at the age of 16, was making his 100th Serie A appearance at 19 years and 49 days and his save from Napoli substitute Arkadiusz Milik must rank among his finest so far. Milik seemed certain to score when Lorenzo Insigne's header found him alone in front of goal but Donnarumma showed extraordinary reflexes to turn his low shot around the foot of the post. "It was an extraordinary save by an extraordinary goalkeeper," said Napoli coach Maurizio Sarri. "The team is doing what it has to do, at the moment we are less brilliant in attack but it was still a good performance." Napoli produced their usual slick passing and pinned Milan in their own half for long periods but lacked imagination and variety in the final third. Sixth-placed Milan had a goal by Mateo Musacchio ruled out for offside in the first half. Juve, who wiped out a 3-0 first-leg deficit against Real on Wednesday only to lose to a stoppage-time penalty, went ahead on the stroke of halftime when Mario Mandzukic volleyed home Costa's cross. The Brazilian winger, who had replaced the injured Miralem Pjanic two minutes earlier, also provided the cross for Benedikt Hoewedes to head the second goal on the hour, then went on a brilliant solo run to set up the third for Sami Khedira. Elsewhere, Benevento forward Cheick Diabate notched up his third successive brace in a 2-2 draw at Sassuolo. Diabate, on loan from Turkish side Osmanlispor, put Benevento ahead with a delicate chip in the 22nd minute. Matteo Politano scored twice to put Sassuolo in front before Diabate turned in Danilo Cataldi's cross to give Benevento their first away point of the season, although they stayed 11 points adrift at the bottom. Fiorentina's run of six successive wins ended in a 0-0 draw at home to SPAL who are 17th with 28 points, just above the drop zone. Bologna's Adam Nagy, 22, scored his first-ever professional goal in a 2-0 win over one-from-bottom Verona.